Texans- Enter Here!! 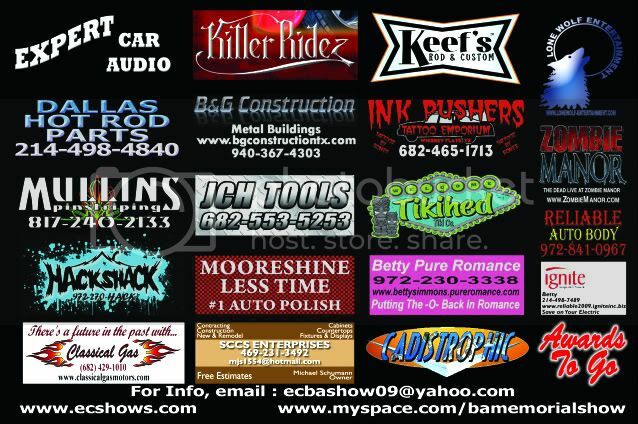 BIG CAR SHOW AUG 22!! 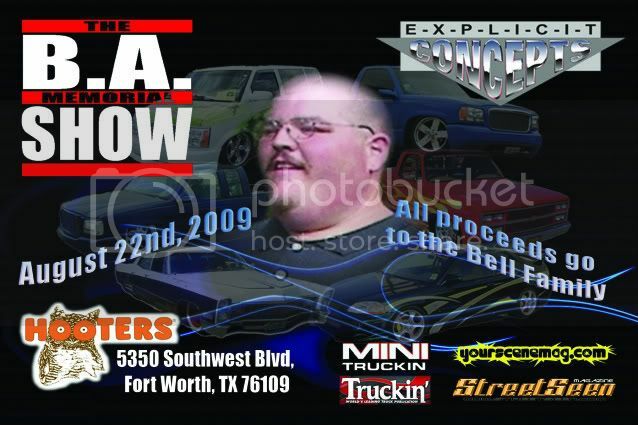 The show will be held August 22, 2009 @ Hooters in Ft. Worth off Southwest Blvd, by Hulen Mall.. Explicit Concepts is proud to be putting together this car and truck show for a friend, a member, and a brother named Chris Eugene Bell aka BA, who passed away March 24, 2009. Chris was known for speaking what was on his mind, his cheerful joking, his beer chugging abilities, and his giant size that lead EC to many tug-a-war victories. Chris’s memories will live forever in EC history and in the car and truck show scene. We are throwing this show in memory of him and to help out the Bell family thru these trying times. All the proceeds from this show will go directly to the Bell family. We are hoping this will be one of the biggest one day event in the DFW area. This Show is THIS WEEKEND!! MARK YOUR CALENDARS! FOR SURE TO BE A BIG EVENT! WITH MUSIC, FOOD, FUN & FOR A GOOD CAUSE!! New Here - Big Boys Toys, Post Your Challenger! Quick Reply: Texans- Enter Here!! BIG CAR SHOW AUG 22! !